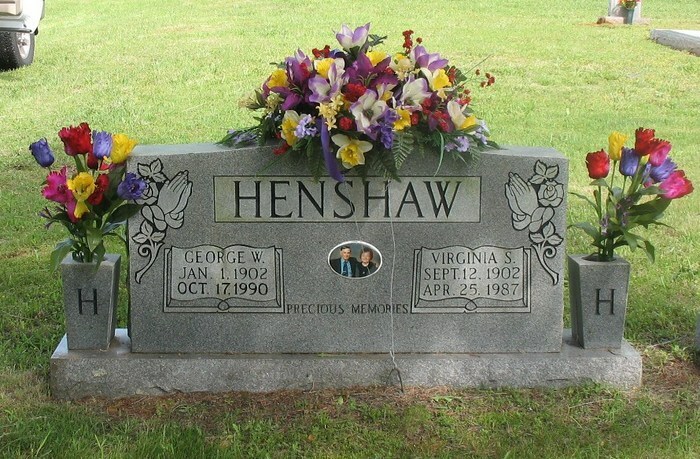 Hinshaw, George W., head-of-household, age 28, born in Alabama; parents born in Alabama; first married at age 23; owned home; no radio in home; occupation: farmer, general farm; not a war veteran. Hinshaw, Virginia, wife, age 27, born in Alabama; parents born in Alabama; first married at age 21. Hinshaw, Lat G., son, age 4 years 4 months, born in Alabama; parents born in Alabama. Hinshaw, James E., son, age 2 years 8 months, born in Alabama; parents born in Alabama. Hinshaw, Annie D., daughter, age 4 months, born in Alabama; parents born in Alabama. Henshaw, G.W., head-of-household, age 38, born in Alabama; completed 2 years of high school; on Apr 1 1935 was living in the same house; owned farm ($400 value); occupation: farmer, farm. Henshaw, Virginia, wife, age 37, born in Alabama; completed 4 years of high school; on Apr 1 1935 was living in the same house. Henshaw, L.G., son, age 14, born in Alabama; completed 1 year of high school; on Apr 1 1935 was living in the same house; attended school. Henshaw, Jack, son, age 12, born in Alabama; completed 5th grade; on Apr 1 1935 was living in the same house; attended school. Henshaw, Annie D., daughter, age 10, born in Alabama; completed 4th grade; on Apr 1 1935 was living in the same house; attended school. Henshaw, Paul, son, age 3, born in Alabama. Living next door on one side in 1940 were George's widowed mother with the family of sister Nola; next door on the other side was the family of George's cousin Ora Clarence Henshaw; one more house away was the family of George's great uncle Joseph Anderson Henshaw; two more houses away was the family of George's cousin William R. Hinshaw. 1940 census, Collins Precinct, Jackson County, Alabama; roll T627-40, ED 36-22, page 1A, line #17, household #4. Ancestry Family Tree data "BARTA/CERNOCH/FIELDS/BISHOP FAMILY TREE" posted by "sooners711".